Omega Seamaster 600M ladies' stainless steel bracelet watch featuring self winding movement, Co-Axial Escapement, white round dial behind a scratch resistant crystal cover. The stunning diamond set bezel adds elegance to this ladies' design. 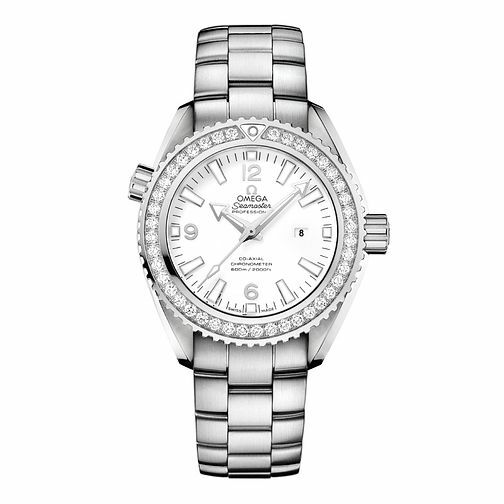 Omega Seamaster 600M ladies' stainless steel & diamond watch is rated 5.0 out of 5 by 2. Rated 5 out of 5 by Anonymous from A very elegant watch suitable for ladies at all age Absolutely in love with this watch, it looks nice form the photigraph but even nicer in real. Very good size and style for ladies at all age, diamonds isn’t too over the top and just right. It’s a good investment which can be passed on from one generation to another. Rated 5 out of 5 by Anonymous from Beautifull Watch Always been a fan of Omegas and this was bought for my wifes birthday. Gorgeous design, really well made cant fault it.